Russia Bristles As NATO Invites Montenegro To Join Military Alliance : The Two-Way Russian officials responded by announcing plans to halt joint projects with the small Balkan nation. The last countries to join NATO were Balkan states Albania and Croatia, in 2009. 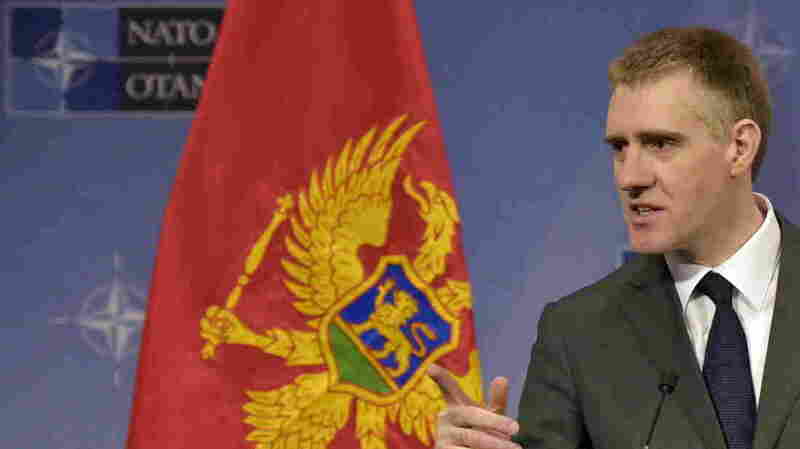 Standing beside his country's flag, Foreign Minister Igor Luksic of Montenegro attends a news conference after Wednesday's meeting at NATO headquarters in Brussels. NATO has invited the Balkan nation of Montenegro to join the military alliance, over Russian objections and threats of retaliation. The invitation by member states was announced Wednesday at a meeting of NATO foreign ministers. "NATO diplomats said the decision sends a message to Moscow that it does not have a veto on the alliance's eastwards expansion, even if Georgia's membership bid has been complicated by its 2008 war with Russia. "Moscow opposes any NATO extension to former communist areas of eastern and southeastern Europe, part of an east-west struggle for influence over former Soviet satellites that is at the centre of the crisis in Ukraine. "Russian Foreign Minister Sergei Lavrov said in September that any expansion of NATO was 'a mistake, even a provocation.' "
After Wednesday's announcement, Russia said it would freeze joint projects, including military projects, with Montenegro — a popular vacation spot for some Russians, The Associated Press notes, as well as the site of Russian investments. U.S. Secretary of State John Kerry pushed back against Russia's concerns, saying NATO is "not a threat to anybody." "It's not an offensive organization. It's a defensive alliance. It is meant to simply provide security. ... It's not focused on Russia, per se, or anybody else," Kerry said. Montenegro is expected to formally complete the membership process sometime next year, becoming the 29th member state. The country's prime minister, Milo Djukanovic, said the invitation was "the crown jewel" in national efforts for reform, the AP reports. But some others in the nation of 650,000 people object to alliances with the West. "In 1999, Montenegro, then in a union with Serbia, was heavily bombarded in the first waves of NATO airstrikes which were triggered by Serbia's violent crackdown against independence-seeking Kosovo Albanians. During the three-month bombardment, Montenegro became refuge for Serbia's pro-Western opposition leaders and dissidents who were persecuted by Serbia's then-leader, Slobodan Milosevic. "Several recent protests by thousands in Montenegro against the pro-NATO government have turned violent."